Whether you’re an avid golfer or enjoy a fun round of mini-golf, improving your golf game is always important. 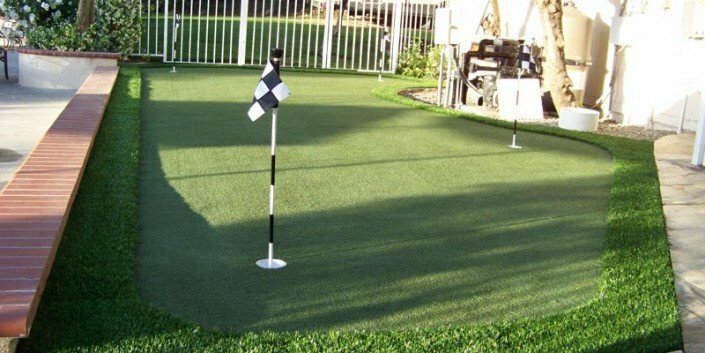 With an artificial turf putting green, you can enhance your golf game in the convenience of your home or office. Practicing your game has never been easier, and a personalized putting green can make all your short game dreams come true. 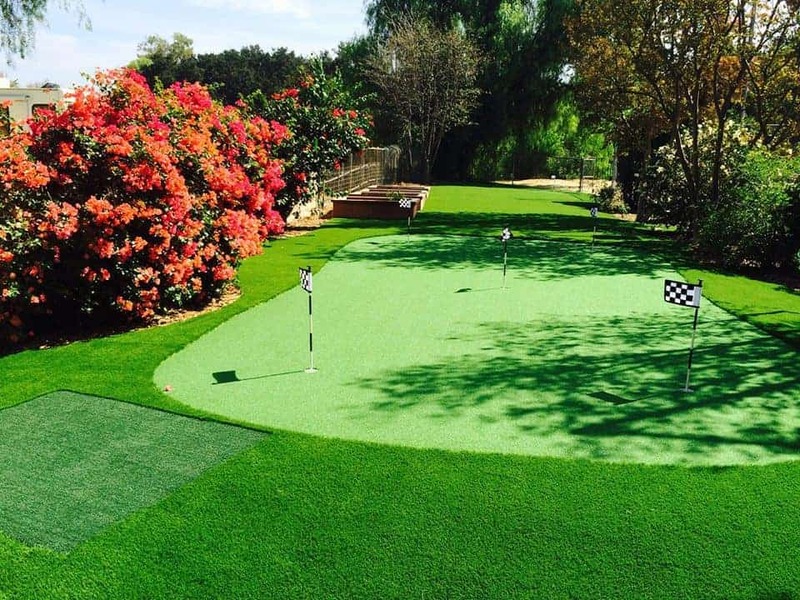 At Duran Lawn Creations, we supply a variety of artificial putting green products that will fit any skill level in Azusa. 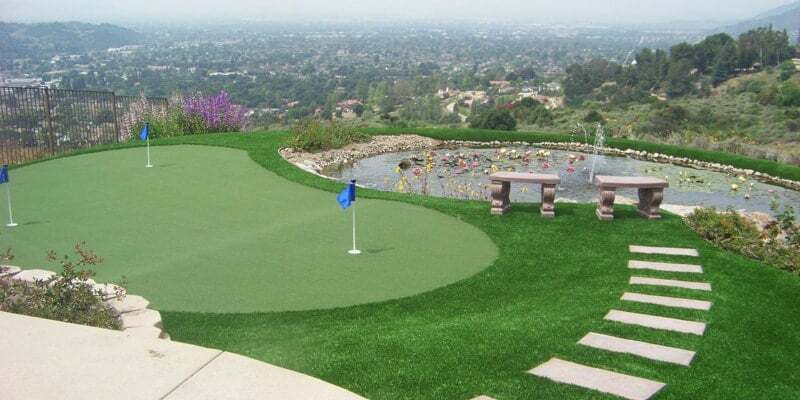 There’s nothing better than having your own 100% customized artificial turf putting green. From design layout to color blend combinations, you can hand pick the style and look for the putting green of your dreams! At Duran Lawn Creations, we can install your Azusa artificial grass putting green in any area, big or small. You are in charge of the design aspects of your personalized putting green and can create the perfect golf course for any skill level of your preference. With the ability to challenge yourself every time you practice your short game, you’ll be prepared for any situation on the course! Our artificial turf putting greens have been tested for everything from quality and wear to bounce and roll – we guarantee that you will receive a professional grade putting green installation that will help you improve your game. One of the most significant benefits of having your own personalized putting green is that you can practice in the comfort of your own home! No more driving down to the Azusa Greens Country Club every weekend or leaving work early to fit some shots in. Whenever you want to work on your short game, go to your yard! Now you are able to practice as much as you like, and not have to share the putting green with everyone else at the range. Installing a synthetic grass putting green in your Azusa home will also benefit everyone in the household – providing a fun and exciting activity that all your friends and family can enjoy while also practicing their short game. At Duran Lawn Creations, all of our artificial grass putting green products are meant to replicate real Bent Grass, providing the highest quality putting green landscape around. Our synthetic turf products are also non-toxic and lead-free, creating a perfectly safe environment for all kids and pets. Here at Duran Lawn Creations, we are dedicated to bringing premier synthetic grass putting installations for all residential and commercial properties in Azusa. If you’re looking to install a personalized artificial turf putting green, give us a call today at (888) 862-8470 for a free quote!